In the interview with Kasljós (26th of August 2009), Ross Beaty stated that he wishes to found the worlds biggest and best company in the field of geothermal energy. He claims to have done so before with another company, Pan American Silver, which he built up and in the year 2007 had become the biggest silver company in the world. In that same interview he also declares himself as a devoted environmentalist. An advertisment from Magma Energy tells us that “Magma intends to exert itself for an increased energy production of HS Orka in Reykjanes and in that way advance job-growth and higher quality of life in the south-peninsula”. It´s an interesting fact that a devoted environmentalist has spent almost half of his life on running a mining company, whereas such operations fall quite short of being categorised as “sustainable” or environmentally friendly. It will also be interesting to see whether Magma will put more effort into striving for a “higher quality of life” than the CEO´s former company, Pan American Silver, with it´s operations in four countries in the South- and Middle-Americas, including Peru. Strikes and demonstrations are common amongst the employees of the company´s silver mines there. Understandably enough, because the company brags about the unrelenting profits every three months. Authorities have a tendency not to demand any social responsibility towards their employees in the cases of companies like Pan American Silver, for fear of driving them away. The argument being used for the neccessity of putting HS Orka into Magma´s hands, is the claim that the company is in a need for a strong foreign investor. But it doesn´t look like Magma is so financially strong. The company has financed itself largely through loans from Icelandic partners; when Magma bought Orkuveita Reykjavíkur´s (OR, Reykjavík Energy) share in HS Orka last fall, much of the price was covered with loans from the seller to the buyer. The rest Magma secured with Icelandic currency bought at a so-called “off-land market”, a market where currency can be bought at much lower rates than the official ones. The Icelandic króna does not grow stronger with this kind of trading, but strengthening it is the main argument for calling out to foreign investors. This time around, a large portion of the selling price is paid through an acquisition of a loan HS Orka had from Reykjanesbær. The web based news-forum Eyjan reported that Magma had announced the companies intentions to seek out Icelandic pension funds to finance further research and development of HS Orka. There’s nothing abnormal about the fact that Magma has to take a loan to pay for the investment in HS Orka, but if the company is as financially stable and strong as it’s representatives state it is, then why doesn’t it take the loans from a foreign party instead of getting a loan from the ones they are buying the shares from? SA, the Confederation of Icelandic Employers, welcome the decision on Magma’s takeover of HS Orka and specifically states that the change of ownership will grant HS Orka a chance to continue their build-up of the Reykjanes power plant. Although Icelandic power companies are not financially strong at the moment, it’s the lack of harnessing permits, rather than lack of finances, that’s holding back further “development” (ie. enlargement) of the Reykjanes power plant. Said permits are being held back, because according to Orkustofnun (National Energy Authority), the energy in the Reykjanes peninsula is already over exploited. Magma’s takeover of HS Orka can be traced back to Íslandsbanki’s (Bank of Iceland, formerly known as Glitnir) energy sortie along with the Independance Party’s plans of privatising the energy sector in Iceland. Advances to that end started in the years 2006-2007 and now the results have begun to see the light of day. The privatisation process of HS Orka began under the joint rule of the Independance Party and the Progressive Party. At that time, Iceland’s economic boom was at it’s peak in the eyes of the public, but in reality the foundations of the banking system had already begun to crack. At the start of the year 2007 the state sold it’s share in HS Orka to Geysir Green Energy, which at that time belonged to FL Group, a holding company directed by Ásgeir Magnússon. He is currently the president of Magma Energy Iceland, a daughter company of Magma Energy. On the 2nd of February of 2007, Glitnir announced that the bank planned to open an office in New York with the purpose of “strenghtening the operations of the bank in North-America, especially within the fields the bank had specialized in; renewable energy, especially geothermal energy and the food industry, mainly fishing industry.” That office wound up in the hands of Magnús Bjarnason and his co-workers who founded the advisory firm Glacier Partners from that office. 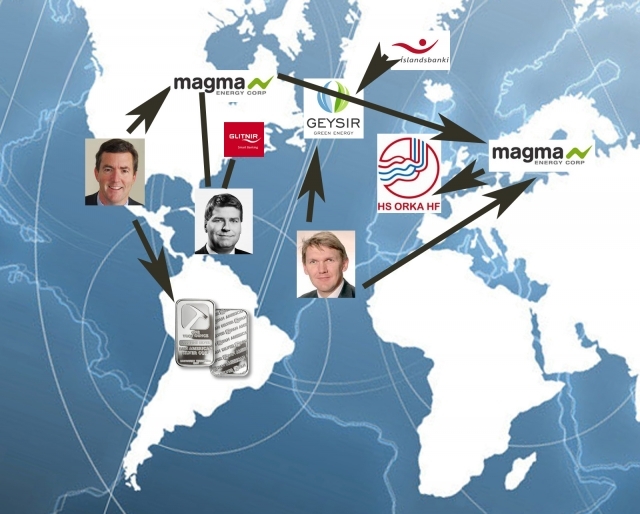 That company, along with another of Magnús’s firms, Capacent Glacier, were Magma’s consultants in the takeover of HS Orka. Íslandsbanki has now wiped the dust from it’s dormant energy sortie, with an announcement made on the 2nd of May this year. According to Channel 2 news from that day, Íslandsbanki is going to open an office in New York which will provide “financial consultation for investors in the fishing- and geothermal energy sectors.” When the Channel 2 reporter asked if Íslandsbanki was preparing a knowledge sortie, the answer from Birna Einarsdóttir, the bank-president of Íslandsbanki was “er, yes…, I would say we were going into export of knowledge”. An announcement from the bank states that “Íslandsbanki has focused on providing service to companies working in the fishing industry and in the field of geothermal energy. The bank now plans to focus more strongly on the international scene and provide financial consultation to foreign companies wishing to invest in these sectors.” The resemblence of the new plan to the one from 2007, which ended with the canadian company taking over the third largest energy company in Iceland, is mildly said uncanny.